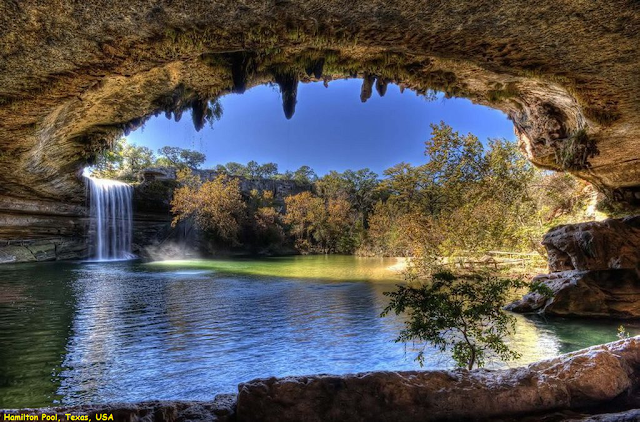 Hamilton Pool Preserve consists of 232 acres (0.94 km2) of protected natural habitat featuring a jade green pool into which a 50-foot (15 m) waterfall flows. The pool is surrounded by large slabs of limestone that rest by the water's edge; large stalactites grow from the ceiling high above. The ceiling and surrounding cliffs of the grotto are home to moss, maidenhair fern and cliff swallows. The Ashe juniper (cedar) uplands of the preserve are home to the endangered golden-cheeked warbler.